I have been dreaming of berry crumble too. Warm with ice cream on top... hmm... the simple things in life that make us happy! that must have tasted amazing after putting up crown molding! Beautiful recipe! 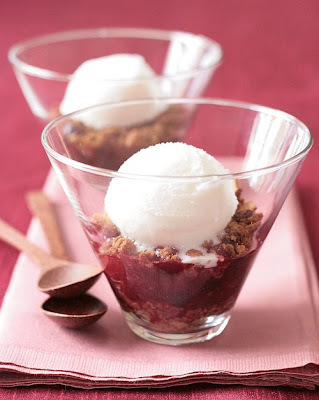 berries crumble with fromage blanc ice-cream: it's better than voodoo to call for Spring! Best of luck with all of your home improvement projects!! And yes, the blogging world IS filled with and "awesome sense of community and incredible friendships." You said it best, Helen! Every time I see one of your photos, the colors just amaze me! I would never have thought of fromage blanc ice cream but it sure sounds delicious over that crumble! Beautiful recipe. I have never had ice cream with formageblanc and living here in Belgium it is widley available. I too think we make so much good friend thrugh blogging. What a lovely simple dessert. I have been thinking about making ice cream but don't have a maker, glad for the instructions for making without. I too am at the almost end of a total renovation. We are getting to the fun part a new kitchen!! Glad when the dust is gone. Beautiful pictures. I love all the glasses, dishes, and props you use. You are truly and artist. You keep giving me new food ideas to try. Crumble is one of my absolute favourite desserts ever, love the idea of the ice-cream made from fromage frais aswell, another one for del.icio.us!!! As always so beautiful and yummy! Wow! Just beautiful! I love the idea of adding a little balsamic vinegar in with the berries -- I'm definitely going to try that next time. They are fabulous, I'm sure they are absolutely tasty especially with balsamic vinegar inside. I love the taste and profume of balsamic vinegar. The weather here is not like spring..seems to be in autumn!! What a wonderful treat. Lovely photos, too. I'd give anything for that light (as well as a serving of your berry crumble of course), it's still really gloomy here in the UK considering we're half way through April. Well, we have no warm breezes...I think I am sitting at 42 with rain. :) But I am loving that so it is okay. I am especially drooling over your ice cream though! Sounds simple and delicious. I love how you snuck in a bit of pepper into this desert. One of my favourite restaurants in the Napa Valley used have a strawberries in a black pepper cabernet sauce over ice cream that was fantastic. I love crumble anything... could eat the crumble by itself, but THIS looks amazing! Lovely photos, as always! 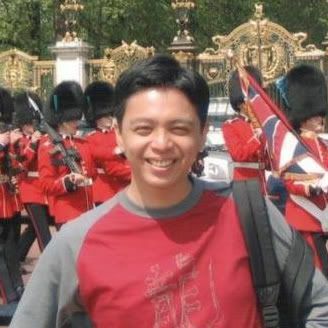 I actually pictured you holding the crown molding and blogging ... too funny! I understand French enough to know that Fromage Blanc is "white cheese" which sounds generic enough to completely lack a description ;-) Is it like a cottage cheese? Mmm, that looks beautiful and delicious. Warm berries and ice cream sounds so comforting. I love the presentation in the glasses, too. my shipment of ice cream maker and weighing scale has just arrived. I can't wait to try this ice cream and of course, your macarons recipes! I like the tone on this background! This looks just wonderful! I haven't ever used fromage blanc, but I make frozen yogurt with Greek yogurt all the time. I love it! I love the warm colors in these photos, Helen. As for home renovations, we know what that's all about. Never again! Good luck with the renovations... I don't think our marriage would hold up if we had to do any more of those LOL! This is a perfect dessert for our sort of weather right now... definitely spring with a sprinkle of summer weather too. Thanks for clearing up the fromage blanc substitution... I was about to think cream cheese (er.. fromage fondu? fromage a la creme?) would suffice! I didn't know Dana was your adopted blogger! I check out her blog all the time. this ice cream sounds intriguing. do you think i could mix some fruit curd in for flavor without sacrifing too much texture? i'm on a mango curd kick lately, and i bet that would be tasty. That ice cream is calling to me. I had something like that at a fancy dinner about 4 years ago, and I've never forgotten it. Beautiful picture and great recipe. 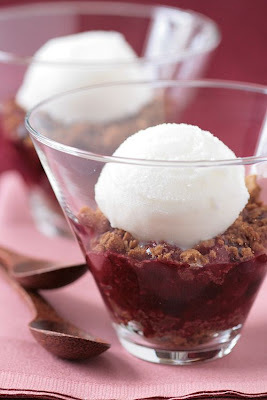 I love the idea of serving the ice cream with warm berries and crumbles!!! Looks delicious! Do you take your own photos? Can't wait to try it, I especially love the coloring and berries. what an amazing combo. great food shot as well. makes me wanna be there to eat it! 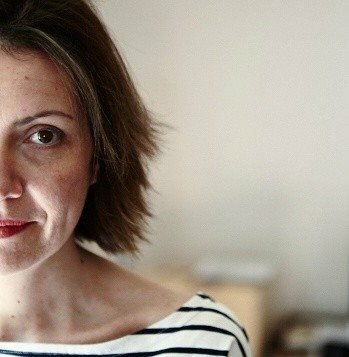 Dis donc en ce moment tu nous régales de douceurs toutes plus exquises les unes que les autres! C'est sûr, prochainement, je te piquerai des recettes! Ton dessert me tente beaucoup car j'adore les fruits rouges, et cette petite glace au fromage blanc doit les accompagner à merveille! J'entends beaucoup parler de granola en ce moment, il faut absolument que j'en trouve quelque part! The glasses you used are beautiful, such a nice presentation! And I love fromage blanc in the first place, as an icecream it must be fab! Ah, a warm berry crumble with ice cream melting on top sounds so good and comforting right now. Even as the days get hotter, I still think that a dessert like this is just perfect to unwind with! Congrats to Kelli for the book! Helen, you always have the most beautiful containers/vessels! These are amazing! And I agree with you about the food blogging friendship. I've "met" so many wonderful, generous people (of course, you're included) and that makes me really happy. Mmmmm, fromage blanc is one of the many things I fell in love with while living in France. I remember going into serious withdrawals when I moved back to the US. 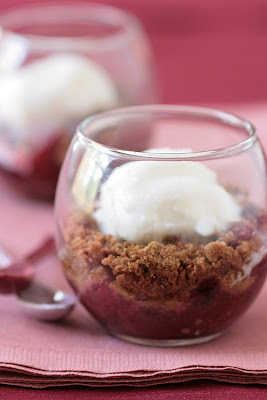 Warm berry crumble with creamy ice cream is one of my favorite desserts after ice cream and cake. This looks luscious, and perfect for the cold Spring we're having here in the NL. Aside from that dessert just sounding good, you always have the most elegant way to present your creations...those glasses are beautiful! I really like how you plated this--it looks mouth watering! That looks, and sounds just delicious! I love all the photo's (never mind the food and receipe's) you post of your food. not only are your pictures amazing, I could just lick the screen every time i read your recipes! i have started making crumbles recently, but it never occurred to me to have icecram with it... what a treat! I absolutley love your food! to die for!!!! I must ask - where is all this rhubarb people keep mentioning growing? My rhubarb plant is just starting to peek out of the ground and won't be ready for picking for quite awhile! Thanks for the shout-out Helen! Merci beaucoup, it really made my day! I was wondering where those random comments on my blog came from. .. I reckon we've got a good few months to go renovating, but at least we managed to get a few rooms finished, so we can retreat there and pretend the building site downstairs doesn't exist. The crumble looks absolutely delicious and I'm jealous of your 'typical April' weather there. Here it's grey, windy and freezing cold! Crown molding in one hand, keyboard in the other - it must be Super Woman Helen! The crumbles (I'd have to go with the ginger snaps) and the fromage blanc . . . those look like little snow balls! Beautiful. And I do like the rhubarb idea too. Oh Helen, my friend - no hope needed here! This will go in the round up without a doubt! Thanks for participating and being so supportive (in multiple ways). oh tartlette, besides the delicious taste i can only IMAGINE -- the presentation for these is just stunning! !